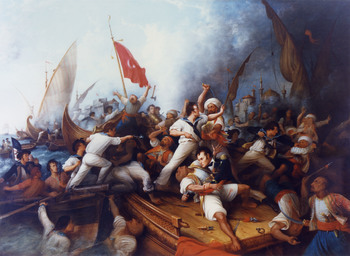 Youthful boys, discipline and juvenile courage the weapons of the young sailors of the United States against the older, more brute Muslim pirates. Romanticism was a complex artistic, literary and intellectual movement that originated in the second half of the 18th century in Europe. It has a complicated relationship to Romance, a term that has had many meanings, but very little to do with the current, popular definition of "romantic", i.e. that which pertains to love and courtship, although love may occasionally be the subject of Romantic works. Rather, it is the exact counterpoint to the ideas of the Age of Enlightenment — that being emotion and imagination is superior to that of reason and intellect. Think Dee Dee instead of Dexter. The individual has a central role in Romantic works; they are usually in conflict with the establishment and go through internal turmoil because of this. Character Development usually occurs. The Nature Lover is a very common figure and voice in Romantic poetry. The movement is also associated with a newfound interest in Oral Tradition and folk culture in general, seen both as a source of inspiration and an object of study. The movement also sought inspiration in The Middle Ages and other past eras; indeed, it drew its name from the Chivalric Romance, and aided in the popularization of Historical Fiction Literature. On the other hand, Romantic authors were also interested in the intensity of human emotions, fear included. Many of their works fit into the Gothic Horror genre. A more surprising aspect of the movement was its hero-worship of William Shakespeare. The long-dead playwright was relatively well known in the British Isles and obscure in the rest of Europe. While Enlightenment critics such as Samuel Johnson, Dryden and Pope had already begun the rediscovery of his works, the Romantics were rather vocal in viewing him as the best of the British authors. They helped revitalize scholarly interest in his works, introduced them to French and German audiences, and drew inspiration from them. This "Bardolatry" continued to have an influence long after the demise of its original proponents. Writers active in the heyday of Romanticism include John Keats, Lord Byron, Mary and Percy Shelley, Samuel Taylor Coleridge, and William Blake. In the mid-19th century, just as Romanticism was beginning to wane in Europe, it hit America in a big way, becoming the Transcendentalist movement, leading lights of which include Walt Whitman and Ralph Waldo Emerson. Though the "age of Romanticism" is long over, Romantic themes are still common today. Most writers and authors in the Romantic era would not necessarily feel that they were opposed to the Enlightenment, however, and the likes of Byron and Goethe would certainly believe that they were continuing in the tradition of what came before. In France, the likes of Stendhal and Honoré de Balzac prized emotion and reason as inseparable. Politically, Romanticism had both a positive and negative aspect. It was inspired by what were perceived to be the successes and failures of The French Revolution and the rise of Napoleon Bonaparte. On one hand, people romanticized the idea of a popular revolution (just as much one of its negative aspects), explored the idea of regional and ethnic identity, and spread the concept of nationalism; on the other hand, people romanticized the revolution (which was infamously savage in its methods), developed a one-dimensional approach to regional and ethnic identity, and contributed to the birth of nationalism. People also became interested in the Great Man theory of history: that is, they believed that history was shaped by exceptional men such as Napoleon. The Romantic movement has its fair share of contradictions. Many Romantics initially started out as quite radical and progressive before becoming conservative, such as Wordsworth. Other authors like Shelley and Byron never sold out and remained liberal to their ends, which, admittedly, came early enough—Shelley at 29, Byron at 36—that they didn't really have much of a chance to reevaluate their opinions; both, incidentally, died in very "romantic" ways, with Shelley's boat being destroyed by a storm and Byron dying of a fever while in the midst of fighting for one of the great liberal causes of the age, the liberation of Greece. Romanticism had its source in the ugliness of the colonialism which thrived during this time, where the Adventure Archaeologist would constantly "rediscover" earlier cultures but write off the modern day nations as The Remnant, thereby justifying their continuous economic exploitation of these regions. Compare Post-Modernism. Related to Individualism; in some ways the predecessor of Symbolism, where the individual is again the central (and, in most cases, only) figure. Fyodor Dostoevsky (1821-1881)note His work is widely considered one of the major "transitions" from the Romantic era to Realism.